I popped a little teaser in last week's March Favorites video about this post coming on the horizon. and now it's officially arrived. I've known about IT Cosmetics since the brand first came out, but I never went farther than a few swatches in the store until recently. Now I've fallen head first into the brand and am resurfacing to share my thoughts on their most popular products. The Your Skin But Better CC+ Color Correcting Full Coverage Cream was the first product I tried and totally made me do a full stop. Dang is this product fabulous. It's a light to medium coverage foundation that packs a serious 50+ SPF. No sun is getting to my cheeks with this stuff. 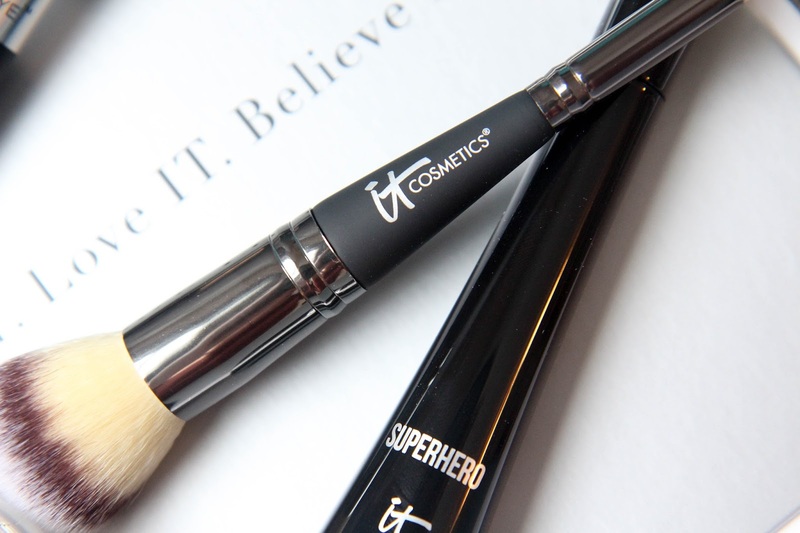 It's super easy to apply and looks great blended in with a brush, fingers, or beauty blender. It covers up redness and any discoloration without looking too obvious or cakey. It lasts practically all day and has the most lovely satin, glowy finish. Plus it's a squeeze tube with a pump. Two of my favorite things. 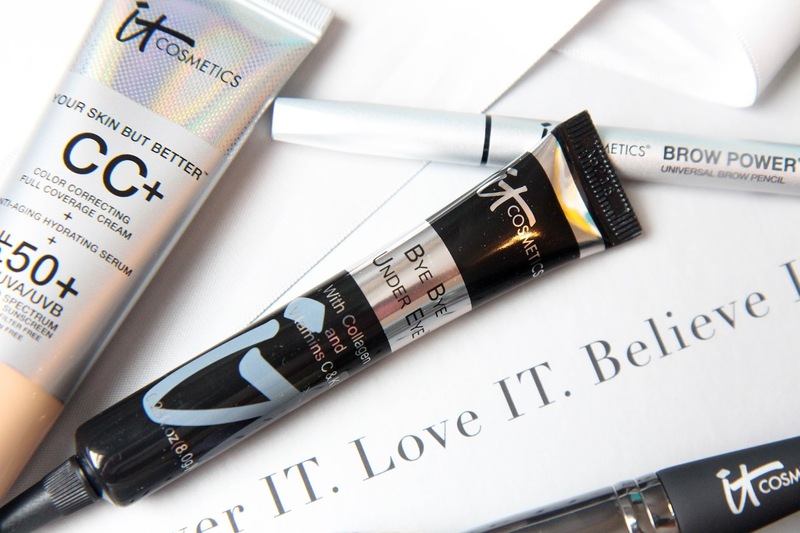 The Brow Power Universal Brow Pencil made an appearance in my March Favorites as a product that's giving the Anastasia Brow Wiz a run for its money. I really like the soft brown taupe shade and larger nub for application. The spoolie is nice and big and I love how natural my lashes look after use. The only downside is the fact that it's more expensive than the Anastasia offering. One product I haven't really gotten behind yet is the Bye Bye Pores Finishing Powder. I rarely use finishing powders to begin with so I've struggled working it into my daily routine. When I have used it though I really enjoyed its light texture and ease of application. It didn't settle into my pores or wrinkles, but I couldn't tell if it was really doing anything. I don't like applying makeup just for the sake of applying it. I'm just not necessarily sold on its effectiveness, or any finishing powder for that matter. IT Cosmetics' Super Hero mascara on the other hand I can totally get behind. The packaging alone is adorable and uniquely shaped. It's great at separating the lashes to create a nice, natural looking end result that holds a curl. It doesn't clump and adds a decent amount of volume to boot. Overall IT Cosmetics really has it going on. Underestimating brands is kind of my thing and this one is no different. The packaging is on point, there's quality in every product, and the results are exactly what I'm looking for. My biggest concern is the price. It rivals a lot of the bigger name brands and just has me a bit standoffish to fall in love completely. Everything feels five dollars more than I'm comfortable spending. A bummer, but definitely not a deal breaker if the quality is there. 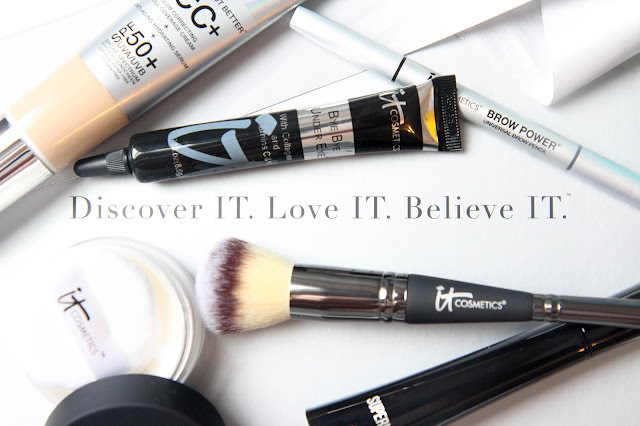 Have you tried IT Cosmetics before?